There are a range of skills, both practical and theoretical, that you must acquire if you are going to be an efficient tester. Writing good bug reports is one of them. As a tester, you will find defects because that is the central part of your job. Once discovered, any bugs that you find will need to be reproduced. The process can then get tough if you don’t know how to recreate a bug because it will cause the entire process to become delayed. But once you have worked out how to recreate the bug, it’s important that you write every detail of all the findings you have made into your report, missing nothing out. Your defect tracking software needs to have the facility for compiling a complete account of detecting and reporting the bugs they find. Within this framework, testers must independently work to hone their descriptive writing skills. What should be included in a Quality Bug Report? The first thing to work on is the title, which will need to be descriptive and clear. A good title does the job of telling the developer who will be fixing the bug, about the main content of the report. It is good practice to be brief and to the point when writing descriptions. These must convey every detail and the context must be accurate and self-explanatory. Remember that the developer who is reading your information hasn’t seen the defect yet and is not in a position to make assumptions. You need to note down specifically how you would expect the software to work and how it diverted to an unexpected direction. This context will help the assignee avoid misunderstanding and give them the correct idea of the mistakes. Often testers will simultaneously test on several version of the apps under scrutiny and the bug the tester plans to report may only exist in a particular version of the app. Within your report, you need to mention the application version in which the bug occurred. Otherwise, the developer may inadvertently debug on a different version where the reported bug probably does not exist, causing a delay in the process. If you can provide any information about the environment you tested on, it might help track down the bug. For example, the devices you worked on, operating system you tested on, model number, browser variant, and more. 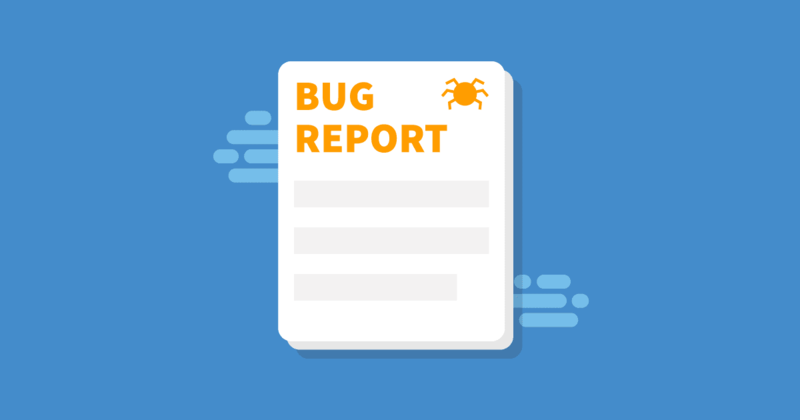 The bug type and its severity are crucial details for inclusion in a bug report because bugs in a functionality have greater priority than one mentioned as a general suggestion or in feedback on the functionality. All involved will need to know the bug’s severity level. All products arrive at testing with some defects, so if the bugs you have found are categorized correctly regarding their type and severity, it can help in the decision making to know what can be fixed easily and what needs more attention. Thus, if the risks can be analyzed and dealt with efficiently, the app will eventually run smoother. It is essential to provide a step-by-step method to illustrate how you discovered the defect. Sometimes you can use a software tool that catches your main strokes, takes screenshots or records video as you test. Also, you can write down the steps from your memory but it is recommended that you take down notes while you test. You must also test your steps before you submit the bug and provide a clear indication of how easily the procedure can be reproduced. This is because it will not be much help if you just write down the steps, but the bugs cannot be reproduced using those steps. You might find bugs but don’t remember the exact steps that lead you to them. In those cases, try out the steps that you can recollect and the more you try, the more confident you will be towards recreating the issue. At times, the bug may only occur randomly or may not appear at all in practice. Even so, you can still write down the findings in your report which could give the developer a hint while they plan to debug. Attaching crash or database logs will also help in such cases. Providing support material helps the experts fix the defects quickly. These are usually screenshots, but can also include audio or video files, device crash logs, database exception logs and so on. Keep these elements in mind before you write the text because if you can explain the problem through a single screenshot, you can save some valuable time. It is a great idea to use tags that can help you to filter out groups related to bugs. You might sometimes want to include another bug ID or links to something that is related to the defect within your report. An assignee will be the head developer or manager who takes delivery of the bugs. When a bug remains unassigned or is wrongly assigned, it’s possible that no one will pick it up. You also need to explain clearly what you expect from an assignee and tell them what needs to be done. When you have addressed all these areas, you will have a proper bug report. If at times, you feel unsure about the quality of your document, you should ask an expert for help or feedback. A brief meeting with all the developers will be helpful and it will also answer their needs.